This house will definitely become your first choice for a vacation spot. With five bedrooms and three baths, even the largest of families have plenty of space to spread out and find their favorite places to relax. The layout offers privacy as well as common spaces to gather. Take the spiral staircase to the upper level which features two master bedrooms with adjoining master bath. 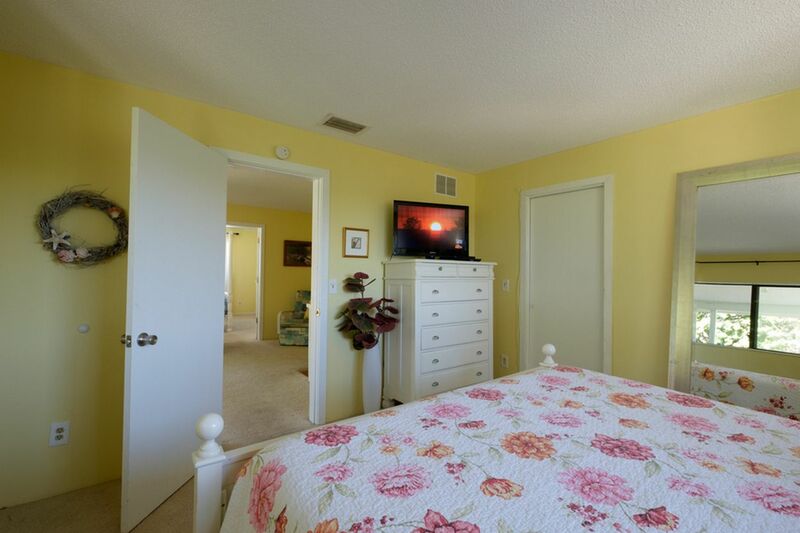 Each bedroom comes with king beds, TV and large walk-in closets. 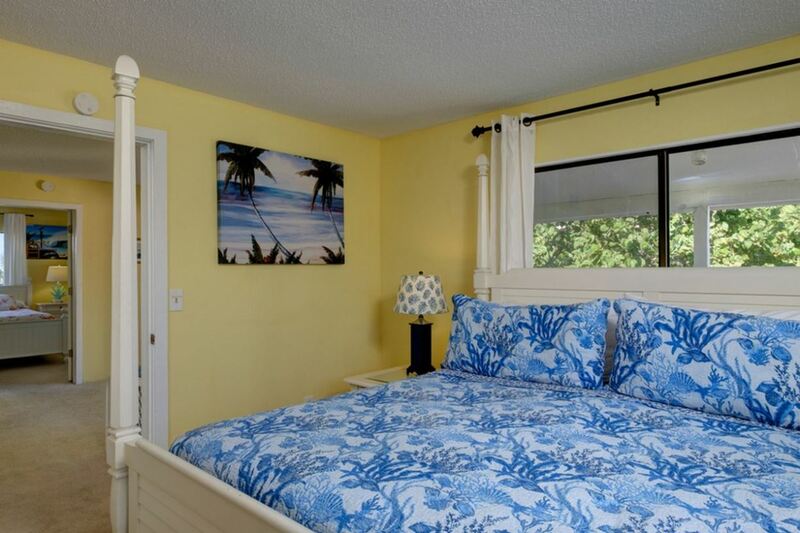 A bonus room sits between them for relaxing with a good book or take it to the balcony for Gulf views and breezes. 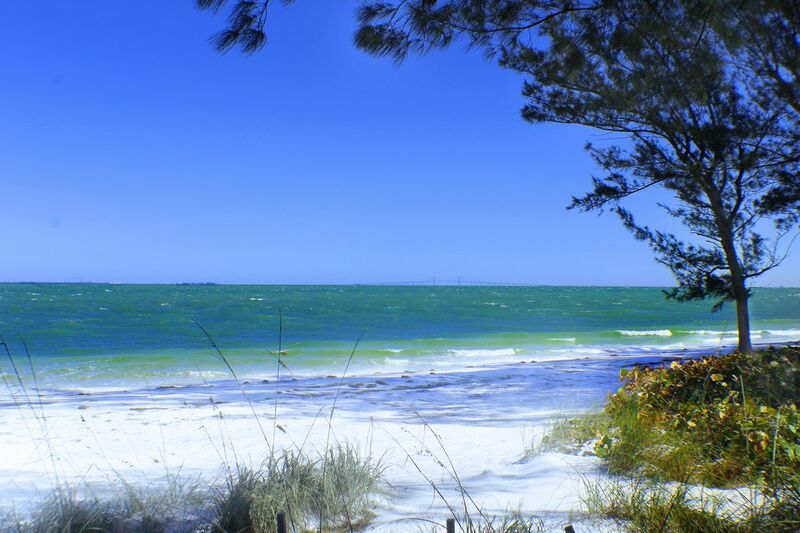 After walking through the back deck oasis and beach path, the Gulf of Mexico is practically at your feet. The main level is perfect for kids and teens, having 3 bedrooms with twins, or bunks and 2 bathrooms to share. You will find the secluded expanse of beach at Casa de la Playa the perfect family playground. 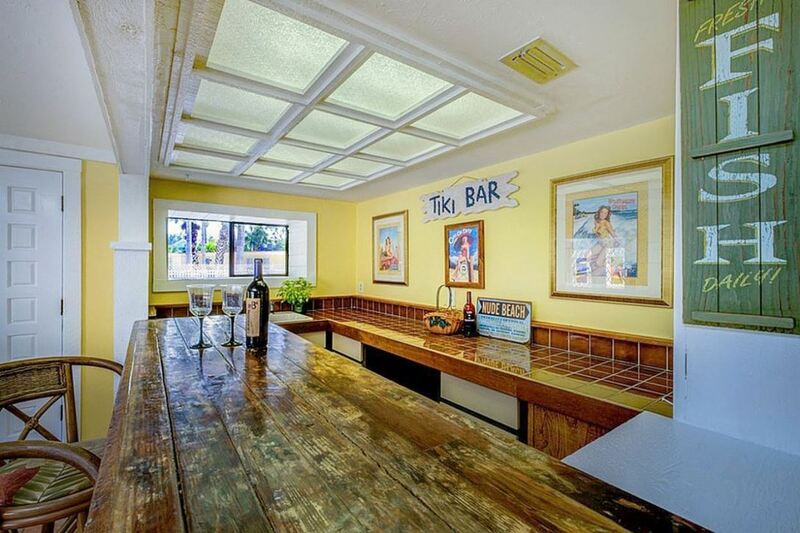 Everyone will love the tiki bar and game room. which provide hours of entertainment: a mounted TV for the big game, foosball, and billiards. The living room has plenty of comfortable seating around a large flat TV. 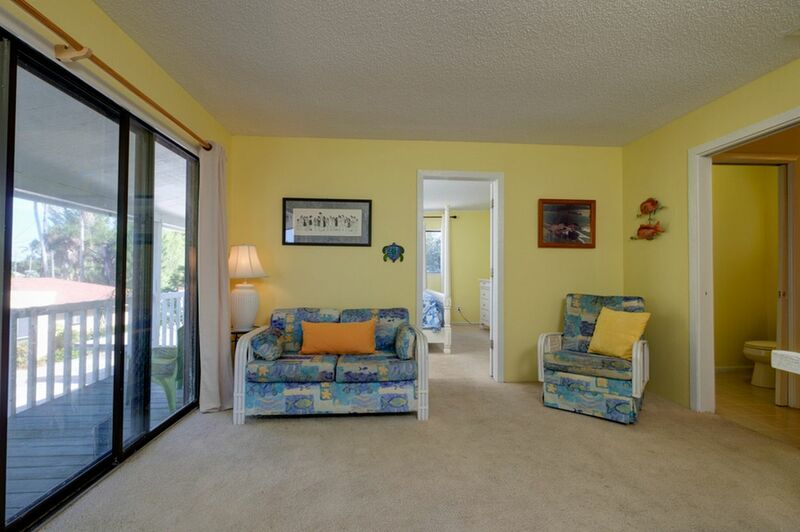 Two sliding glass doors exit to the patio area, beach side, and secluded tropical garden. The owners have provided a fully stocked kitchen as well as outdoor deck seating and snack bar options. The Island is blessed with an abundant source of family-owned restaurants, and some of the best fresh seafood you will ever eat. 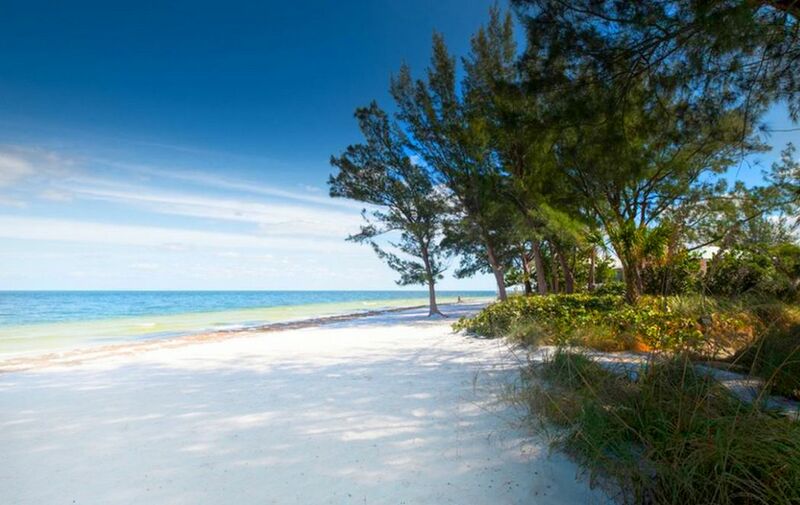 Just outside, stroll the private boardwalk to the silky, sandy beaches of the Gulf of Mexico for a fun family day or to enjoy the breathtaking and romantic sunsets. For those days when you cannot drag yourself away from the beach, take a walk right to the Rod and Reel Pier for the best grouper sandwich and other seafood specialties. Stay for fishing, bird or dolphin watching, or shell collecting. Further down the bayside is Bean Point Park, the Anna Maria City Pier, and Island Trolley stop. Take a free ride to see what lies on the rest of the Island, or cross the road for great shopping along Pine Ave.
Property has private walk to Sandy beach - wonderful! This house is located at the confluence of the Bay and Gulf waters. Wide open beach space is steps away. While this property is older, it's interior is clean. With two king bedrooms sharing a bath area upstairs and three bedrooms sharing two bath areas downstairs, there's room for all. The Tiki Bar and game area (foos ball and pool table) provide a special gathering area, inviting fun interaction for most ages. The kitchen is on the small size but adequate enough to prepare full family meals (nice feature: gas cook top and range). The large dining table seats 10. The living room and upstairs bonus area give everyone a place to retire to. The outside pergola is covered with greenery and provides a lovely spot for morning coffee or evening glass of wine, or alfresco dining. There is plenty of deck space for all to gather. The outdoor gas grill provides the family cook a nice cooking option. The gorgeous white sugar beach is steps from the house with a private lighted pathway. The morning sunrise can be viewed right off the private deck at the end of the path. Out and to the left, unbelievable evening sunsets are steps away. This house is quirky. It comes with lower ceilings, unusual floor plan, spiral staircase to the upstairs bedrooms/bath/bonus area and lights and light switches that make you scratch your head. But all in all, this just leads to it's charm and provides a unique experience. My family of ten was in the house for eight days over Thanksgiving 2017 and had a ball! Our stay was amazing. You can’t beat the location of the house. The beach is prime and has a couple of trees for shade while your enjoying the beach. Daily we saw stingrays, dolphins, and manatees right off shore, it was great! The house is spacious with plenty of room for our 11 family members. Everyone had their privacy and bathroom space. Right outside the house is a large deck with a pergola for shade or just enjoy the night with a few drinks outside. The house had plenty of water toys and towels to go around. Short drive to shops on the Island. I would suggest this house to anyone traveling to Florida. Overall the property was perfect for us, 5 ***** The property provided everything we wanted, plenty of room for 11 people, beautiful beach right outside your back door, close to good food and different beaches. We had a blast here enjoyed every minute we stayed.